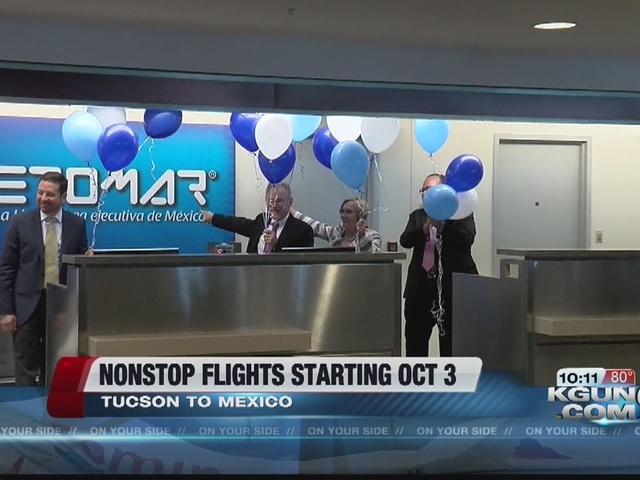 Tucson International Airport announced nonstop round trip flights from Tucson to Mexico. Starting October 3rd, you will be able to fly round trip from Tucson to Hermosillo for about $330 with taxes and a free carry on. TIA partnered with Aeromar Airlines. This will be the airport's 19th round trip travel destination. About 30,000 people from Mexico cross the border from Nogales every day and spend about $22 million, according to Jose Felipe Garcia, the Executive Vice President at Visit Tucson. Garcia said that having this relationship with Mexico will increase tourism, trade and business. "When we bring people from the outside they have money in their pockets and they are coming to shops, restaurants, and staying at hotels," he said. "They are paying taxes while they are here so that helps every single individual for our schools, our libraries, our police and fire." "If you want to fly out of Phoenix from Hermosillo it is about $600, so we might see some people from Phoenix driving to Tucson to fly out of Tucson because of the cost," Garcia said. Both Garcia and Mayor Rothschild predict more people will be traveling to Tucson more frequently and spending money when October comes around.